Airing Laundry Clean – With The LaundryPure | OhGizmo! I have to say based on the limited information available on its website I’m a bit skeptical about this product. And while I may not be an expert on the science behind the technology, I can definitely see it would have some advantages. The LaundryPure unit mounts on top of your washing machine and through the use of built-in UV lamps (which are visible to the user via small windows) infuses millions of tiny ozone bubbles into the the water as it’s pumped in during both the wash and rinse cycles. As a result fabrics will apparently be softer and more “bacteria-free” than just a standalone washing machine can do. While the site says hot water and fabric softeners will no longer be needed, it’s not clear whether or not soap is still a requirement. However its claim of 100% non-polluting wastewater makes me assume it will replace detergents as well. Hello,I am a Ecoquest independant dealer,and have seen firsthand the Laundrypure unit in action,and all I can say is WOW!!. THIS UNIT IS GOING TO CHANGE THE WAY WE DO OUR LAUNDRY. I already have my certificate,and I will be inviting my friends and family over for laundry parties(new word)if any one would like more information please feel free to contact me at 1(440)452-5119 or by Email. How does Laundry Pure stack up against Samsung’s new silver oxide technology? They claim that the silver oxide eliminates the need of hot water and bleach to eliminate bacteria. And saves 92% of the energy of a hot wash! Anyone know? So far we’ve had 2 ecoquest dealers say how great it works. I’d rather wait for an independent study from an organization like Consumer Reports to tell us the real truth. “To tell us the real truth”? Sounds like Jose has already made up his mind. Yeah, I made up mind to rather wait for a reputable organization like CR that isn’t biased on any product it reviews. Your selling this product aren’t you? So, of course you’re going to tell me that its great. Hello Again to everyone. I have sent out 17 machines on trials and all positive feedbacks so far. Please don’t miss out on this oppurtunity. It is a 30 day money-back guaranteed trial. If anyone else is interested please e-mail me at [email protected]. I promise you’ll be happy you did! Hello Everyone. NSF has tested LaundryPure and was able to achieve a 99.9999% reduction for Staphylococus aureus and Klebsiells pneumoniae and a 99% reduction for Psudomonas aeruginosa. Now for a great visual on a real world stain test from the field visit:http://www.chippynews.com/laundrypure_stain_test.htm As for the Samsung washer think about this: in order to get that technology you have to buy the washing machine and you still need detergent. LaundrtPure will connect to almost any washing machine and is 100% pollution free! The real beauty of this unit is you don’t have to separate the dark from your white clothes ! The savings alone on not having to use detergents,bleach,fabric softener and no hot water is enough that it will pay for itself quickly. The environmentalists will love it as you won’t be putting soap and other harmful stuff back into the groundwater. Hunters will like this as well,game won’t smell you. Further,if you’ve ever left your clothes in the washer,forgot to take them out,they have that awful smell. Well with Laundry Pure it still smells fresh. As far as pre-spotting,that isn’t a problem,as They sell ecoH which takes care of just about any stain. I am very happy with mine and others I know as well. This will take off like when Micro-waves first came out and their were many skeptics then. These new washing machines with the silver in them are very costly,at Lowes $1200. To add to this,you don’t need an expensive washer with all the doo-dads. Well, appart from the question “does it work”, there is another one which is of some interest (in the case it works) what is the additional cost for the 2 UV bulbs to change “around every 3 years” and the Silver probe “to change around every year”. Plus where to find them ? They don’t seem advertised anywhere… It would then be amuzing to compare that cost against detergent and hot water cost, don’t you think so ? Well anonymous, you can purchase one from any Independent distributor of EcoQuest products of which I’m one. You can contact me at 636.244.0588. The Silver Ions probe is replaced after about 450 loads of laundry and depending on tax and shipping it will cost between $30-40 to replace. You are then good for an additional 450 loads of laundry. The same cost is approximately how much it will cost to change the UV bulb. On other benefit is that your clothes and linens will last longer. Detergents act like little knives that break down the fabric. The list can go on. Our products all carry a 30 day money back guarantee! My wife and I are checking out the EcoQuest business. We want the straight scoop. I see the posting above, by Edward Bell, who says the laundryPure has been tested by NSF. I have searched the NSF website, but find no mention of the product, although EcoQuest is listed as “certified”. If anyone can tell me where I can find the NSF report, I would greatly appreciate it. For the sake of full disclosure: I am an EcoQuest user. I am NOT a dealer, I am NOT a distributor, I have no vested interest. That said, I bought the air cleaner, the one with the LCD display (Freshair or Living Air, i think). We live in Minnesota, so our house is closed up for a good 6 months of the year. Once we started using it, we didn’t get sick any more. I put it next to a fresh air intake for our heater to have it distribute the ozone throughout the house. It works. I’m VERY happy with the purchase. So I bought the Laundry Pure at the MN State Fair. I can say that it works too. The clothes are clean, fresh. Everything they say it does, it does. I am impressed. I think its worth the money, but that is a call you’ll have to make for yourself. I have used the LaundryPure for two months. It works very well but some notes must be taken. DO NOT mix colors and white as stated above. Blue jeans WILL turn white t-shirts blue. Try it you want with some and see what happens if you are willing to risk it. Secondly, you cannot have ferrous iron in your water as the oxidation process of ozone will turn it to ferric iron and cause stains. Hard water will eventuall cause the tube to build up with scale deposits and defeat the effects of the UV lights. So be aware of some minor hurdles that need to be jumped before getting great results. I have use it for two months and have used zero detergents and no hot water. The savings are hitting home everytime i use it…and clothes are clean. I have just purchased my second unit. It has worked so well that I decided to use another one in a different location. I’m looking forward to getting one for my sister for Xmas. I have used one now for 2 years. I have had to send it in for repairs three times. More down time than using time. The glass tubes inside break, then your laundry room gets flooded. HOw do you become sales rep for this machine? Wonderful article, just added the site to my favorites. Thanks so much. I suppose my costs have broken even by now with soaps and hot water. I do like the idea of not contributing to the environment all those phosphates, etc., and reduces my gas bills from hot water use. I have purpchased two LaundryPures and have now just past one year–time for buld and probe changes. So far there have been no service issues (outside a trade in on one of them when it didn't work on original set up, which was done at no cost to me). Tough stains still need soaking in a soapy soluton and white–we still bleach them. But all other clothing come out wonderfully. DON'T mix colors (blues jeans, etc.) with whites. Clothes smell fresh and are clean. You must have soft, iron-free water or it will cause problems. Bulb and probe changes are recommended yearly at about $60.00 per unit. Even with that cost, the savings in no hot water or detergents (which makes clothes last longer-less lint and color fade) use, makes it a great value not only in dollars but also environmental waste. I would buy another one in an instant. Nice artical! You site looks great. Hope to find more interesting things in your website. How does Laundry Pure stack up against Samsung's new silver oxide technology? They claim that the silver oxide eliminates the need of hot water and bleach to eliminate bacteria. And saves 92% of the energy of a hot wash! Anyone know? 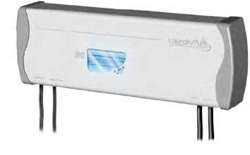 The LaundryPure uses a silver probe which emits silver ions also. That combined with the ozone creates a pretty good clean mechanism. The silver probe needs to be replaced as does the UV bulb.